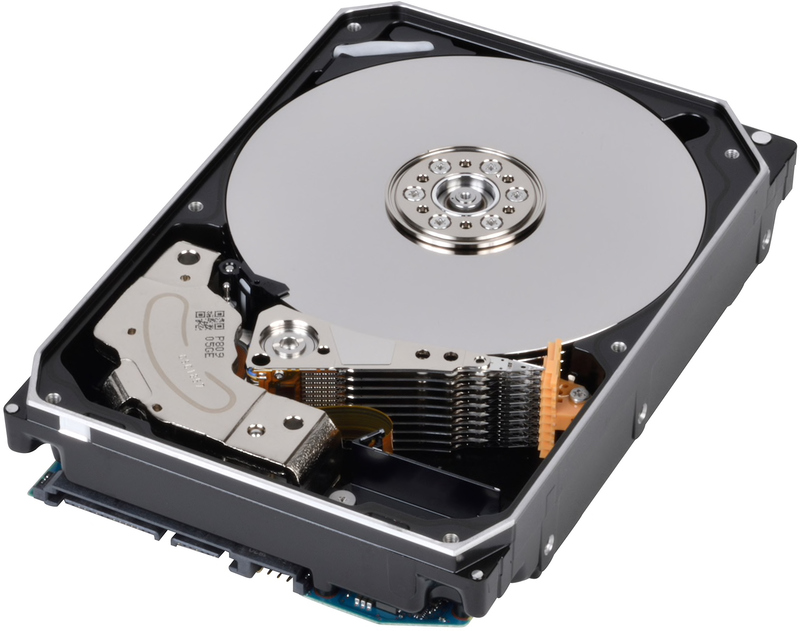 Toshiba has announced the industry’s first hard drive featuring a 16 TB capacity. The MG08-series HDDs are designed for nearline applications and use two-dimensional magnetic recording (TDMR) technology, therefore offering consistent and predictable performance. Toshiba’s MG08 3.5-inch helium-filled hard drives rely on nine 1.7 TB PMR platters developed by Showa Denko K.K. (SDK) as well as 18 reader/writer TDMR heads designed by TDK. The HDD features a 7200 RPM spindle speed, a 512 MB DRAM buffer, and a SATA 6 Gbps or SAS 12 Gbps interface (depending on the model). Since the MG08 HDDs are aimed at nearline applications that use hundreds of hard drives per rack and are subject to severe vibrations, the HDDs feature top and bottom attached motors, RVFF as well as environmental sensors and other innovations designed to improve reliability and ensure consistent performance. Just like other nearline HDDs from Toshiba, the new MG08-series supports the company’s persistent write cache (PWC) with power loss protection (PLP), which is crucial for 4K sector drives that emulate 512B sectors. The PWC with PLP feature protects data in case of power loss while performing a read-modify-write (RMW) operation to align the source write request with the physical sectors it has to modify. RMW enables Toshiba to address clients who run legacy systems with high capacity points. Toshiba’s MG08 drives represent a number of industry firsts. First up, Toshiba is the only company in world to use a nine-platter HDD design. It was necessary with its 14 TB hard drives as the company did not use TDMR back then (unlike Seagate). Secondly, the MG08 uses SDK’s PMR platters featuring a 0.635 mm z-height, that’s down from 0.8 mm disks usually used for eight-platter designs. Thirdly, it uses TDMR heads developed by TDK, which enabled Toshiba to use the said platters. Surprisingly, Toshiba does not disclose performance numbers for its latest drives (possibly because it is still polishing off their firmware), but it is logical to assume that the new HDDs are faster than their predecessors both in terms of sustained transfer rate as well as random read/write operations because of higher areal density, an enlarged cache and other factors. Toshiba rates its MG08 HDDs for 550 TB average annualized workload, 2.5 million hours MTBF and covers them with a standard five-year warranty. It is going to take Toshiba’s partners four to six months to validate the new HDDs before deployment. Therefore, mass production of the MG08 hard drives will start several months from now.